For this peach and strawberry cobbler, juicy unpeeled (yay for no peeling!) peaches are combined with luscious in-season strawberries and set atop layers of browned butter and cobbler batter. Summer dessert heaven! When the air is dripping with humidity and we’re too naïve to turn on the air conditioning thinking that, at some point, there’s got to be a breeze, there’s nothing I like more than throwing together a dessert in 10 minutes of prep time. Well, I guess there’s one thing better than that: a dessert with gorgeous summer fruit plus a sprinkle of brown sugar. All baked together and a little magic happens. Since the cobbler is made backwards with the fruit on top and the batter on the bottom, you’d never think this recipe would work correctly…but it does! The batter rises to the top with the help of some baking powder, covers the fruit, mixes with the brown sugar, browns up to crunchy sugar edges, and the result is a divine and not overly sweet dessert. If you really want push it to the next level, add a scoop of ice cream – mine was homemade cinnamon-vanilla bean and it almost overshadowed the cobbler. Almost. This peach and strawberry cobbler was by far the high point of my day yesterday and since I can use virtually any kind of fruit in place of the peaches and strawberries (fresh or frozen! ), you can hedge your bets that I’ll be making this cobbler even into the fall after we go apple picking and pears are back in-season. My pal Josie chose this recipe as her choice for Project Pastry Queen this week so make sure you head on over to Pink Parsley to check out her version! Preheat the oven to 350° F. Set an 8-inch square baking dish aside. Over medium-high heat, melt the butter in a small sauce pan until it becomes bubbly and turns a nutty-brown color. You’re essentially browning the butter here so watch it carefully to prevent it from burning. (And it will burn quickly!) Pour the butter into the baking dish. In a medium bowl, stir the granulated sugar, flour, baking powder, salt, and milk together. Gently pour the mixture over the butter, but do not stir it into the butter. Carefully arrange the peaches and strawberries evenly on top of the batter – don’t bother making them neat but don’t press them into the batter either – and sprinkle the fruit with the cinnamon and then the brown sugar. Bake the cobbler for 40 to 45 minutes, until the batter has risen to the top to cover the fruit and it is golden brown. Serve warm with ice cream or at room temperature. Keep any leftovers refrigerated. Holy moly that looks fabulous. The ice cream sounds dreamy as well. Sending you some breeze vibes 🙂 Buzzed! Just beautiful! What a great canvas for all the fresh fruit I find at the farmer’s market! 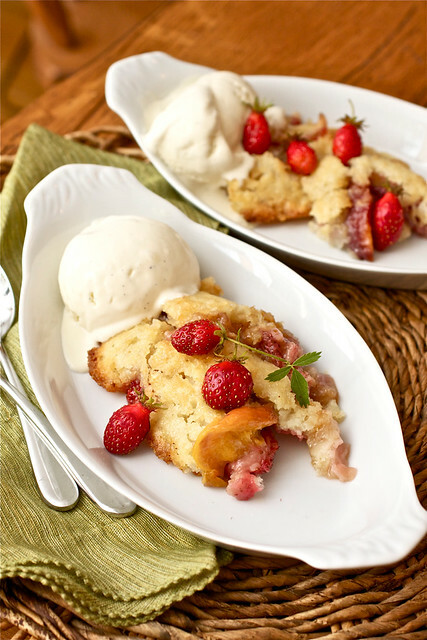 I made a peach and strawberry shortcake… this cobbler is right up my alley! Tara, what a gorgeous dessert! I love peach cobbler, so know a strawberry peach cobbler would be just as fabulous! Love the flavor combination! Sounds like a perfect summer dessert! What a fab idea to add strawberries. and your photo is gorgeous! This looks great! We’re hosting an online seasonal potluck and June is strawberry month! If you’d like to link your recipe, we’d love to have you. I made this last week with blueberries and peaches and again today with peaches and strawberries (taking it to my parent’s BBQ tomorrow). It is delicious! So easy, and absolutely divine!!!! I will try it again this fall with apples! Cannot wait!